Sometimes you need to cook for a crowd. Sometimes that crowd is very mixed – young and old, male and female, picky and not picky. You catch my drift. I find it best in those situations to turn to good old macaroni and cheese. Graham turned six (!) on November 28th (more thoughts on that milestone when I can actually write the post without crying). We decided to have a party for him the day after Thanksgiving. I found a very cool activity for the kids to do which happened to be right near our house. As I was planning this little party, I felt very strongly that I wanted to have everyone (parents included) back to our house for dinner afterward. And I felt even more strongly that I did not want to serve everyone the pizza fall-back that seems to be inescapable at a kids’ birthday party. There is nothing wrong with pizza. In fact, I love pizza and it is a terrific thing to serve to a mixed crowd, but I just got it in my head that I wanted to cook for these friends and family members. Yes, we had just hosted 16 adults and 4 kids for Thanksgiving. What can I say? I got help with the turkey feast and also I am insane. There was never really any doubt about what I wanted to make for the party but I wanted to change it up. Since we all had just feasted on turkeys and stuffing and potatoes, I decided to lighten up the mac and cheese quite a bit. 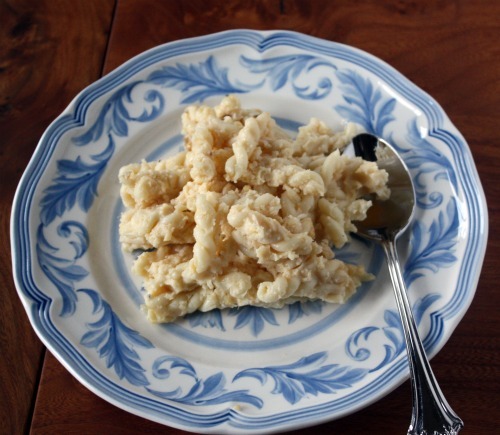 A few years ago, I found a recipe for it using cauliflower in place of some of the milk and cheese. I thought it turned out really well and I decided to re-visit that idea for Graham’s party. I love mac and cheese as much as the next person but I always feel like it needs something else. One note food tends to bore me after a few bites, no matter how delicious those bites are. I decided to add some mustard for tang and heat, and some smoked paprika for some, well, smokiness. Now, this is not spa food. There is butter and there is milk (2% though! ), and there is still a pound and a half of cheese here. BUT. There is also 2 pounds of pasta. I made it to serve a large number of people. Like 24 adults and 10 kids. Not everyone ate it of course, but most did and I still had a bit left over. Considering your standard mac and cheese has about a pound of cheese for 12 ounces of pasta, this is substantially lighter. The cauliflower is virtually undetectable here. I’m not a big fan of hiding vegetables in my kids’ food. I want them to recognize vegetables for what they are and choose to eat them, not trick them into it. But seeing as there is no way in hell that either of them would eat cauliflower willingly, I am glad that they got a little dose with their noodles. I realize that you may not have many occasions to make such a large portion. Nor may you have a pan to fit it all in. I had a couple of large aluminum dishes that I bought for a long-ago catering job and that is what I used. You can certainly fit all of this into two large baking dishes (like 13×9 or 15×10). I’m also sure you can cut the recipe in half and just make a more normal sized (though still very generous) portion. I did not test the recipe that way so I am giving it to you the way I made it. 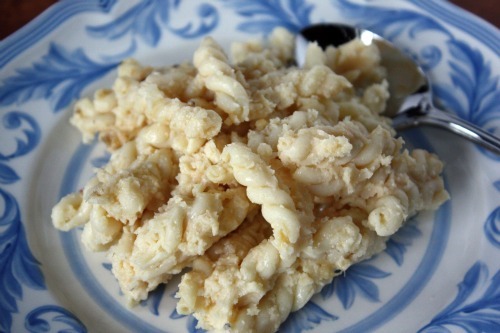 In spite of the name of this dish, I almost never use macaroni when making mac and cheese. It’s too small and boring for me. Other short tubular shapes are more interesting. Preheat the oven to 375ºF with the rack in the middle. Bring a large pot (at least 8 quart) of salted water to boil. Add the cauliflower florets and cook until fork tender. Using a slotted spoon, transfer the cauliflower to a food processor. Add more water to the pot and then add the pasta. Cook until al dente, according to package instructions, then drain. Toss the pasta with a bit of olive oil to keep it from sticking and set aside. Meanwhile, add the mustard, smoked paprika, and 2 teaspoons of salt, to the food processor. Pulse until chunky. Pour in 2 cups of the milk through the feed tube and process until you have a smooth and loose purée, adding a bit more milk if it seems too thick. You want it like extremely thick cream. Melt the butter in a large Dutch oven or similar type pot. Sprinkle in the flour and cook, stirring constantly, until the flour darkens slightly in color and smells nutty, about 3 minutes. Pour in the cauliflower purée and stir well. Slowly pour in the remaining cup of milk and the half-and-half. Cook for about 5 minutes, stirring often, until rich and thick. Turn off the heat, add both cheeses, and stir until everything is nice and melted. Place the cooked pasta in a very large bowl. Pour the sauce over top and carefully mix until the noodles are completely coated with sauce. Butter one extra large or two large baking dishes and then pour the coated noodles in. Sprinkle with either panko or bread crumbs and cover with foil. Bake for 30 minutes then remove the foil and bake for another 10. The center of the pan should feel hot. So THIS is what I bought that mega large (like enough to make a cake for 30 people large) cake pan for! Awesome. Hiding the cauliflower is very Jessica Seinfeld of you but you know, I’ve always wanted to try the mac and cauliflower/cheese recipe from her cookbook because even though I LOVE veggies (even cauliflower) I figure that if I’m going to be eating mac and cheese, I might as well get something healthy into it as well. You are seriously crazy for cooking for that many people. But that’s why we get along so well. LOVE the addition of cauliflower!!! I love cauliflower with pasta and breadcrumbs, so why not w/ mac and cheese? Perfect! This looks soo good, Dana. The cauliflower component sounds tasty, can’t wait to make the dish. Happy bday to Graham! I love the idea of making mac and cheese a little healthier–it’s one of those delicious and oh-so-comfy foods, but all the fat and the shortage of nutrition makes it a rare treat! Thanks for suggesting a still-delicious alternative. I have a thing for trying different versions of mac and cheese. Adding cream cheese in one was a disappointment, but one of my favorites includes broccoli, so I know I’d like this! I love this lighter version! Great idea of sneaking in some veggie in there; love the extra-sharp cheese too! Love the addition of cauliflower. I always add mustard to my cheese sauces – something my mum always did. I do it to add zing to the cheese and just because I always have. Love this recipe! The cauliflower is brilliant. We’ve had blustery cold nights this week, so I think I will have to add some mac and cheese to the menu. I’m always up for a mac & cheese recipe and love that this one has cauliflower in it! Not that I need to be enticed to eat cauliflower.